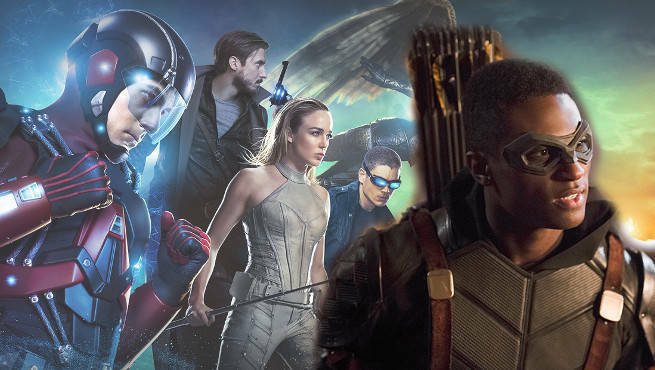 After appearing on last week's fan-favorite episode of DC's Legends of Tomorrow, TV's Connor Hawke -- also known as The Divergent Series: Allegiant antagonist Joseph David-Jones -- says it's likely that one, doomed timeline is likely not the last time we've seen him. In Legends of Tomorrow -- as in the Booster Gold series that inspired it -- fractures in the timeline yield bleak alternate futures -- which while not "solid time" yet and hardly permanent can still draw the attention of our heroes, who aim to help out those whose lives have been shaken and shaped by the damage to time. One such character was Hawke -- the son of John Diggle in a bleak future where Ray Palmer and Sara Lance never defeated Vandal Savage and returned to 2016 to save Star City. "I know that a couple of the writers are trying to push to get me back in there, because they really do like what happened with the episode," David-Jones said. "I know that they're trying to put me back in there but I don't know what they're going to come up with or what even is going to happen with Connor Hawke, but I know they've been talking about potential different outcomes of it because they are plan on cycling out some of the cast from the ship. So I don't know what's going to happen, or if that timeline is still set until they actually do go back to the past." The biggest takeaway there, of course, is that guest stars on the show are being led to understand that some of the Legends could be "cycled off" the Waverider. That's something many fans have guessed, with speculation being that characters like Vixen or John Constantine could join future seasons if such a thing were to happen. Plucking a time anomaly like Connor could also provide some interesting story possibilities because it would give a big, glowing beacon for time-travelers chasing after the Legends. Check back soon for much more from our conversation with Joseph David-Jones. DC's Legends of Tomorrow airs at 8 p.m. ET/PT, Thursdays on The CW.